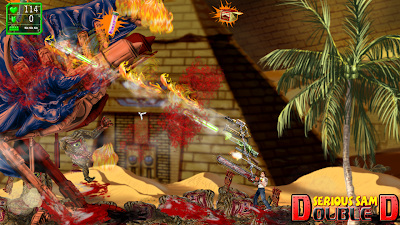 Serious Sam Double D is a 2D side-scrolling version of the popular and looney Serious Sam franchise, and will be ready for you to play later this summer on your PC! When designing Double D, rather than dump all of Croteam's original guns and start from scratch I decided it'd be fun to take on the biggest of Mental's baddies with all your guns blazing at once. The way you'll get to do that is with the Gun Stacker system. 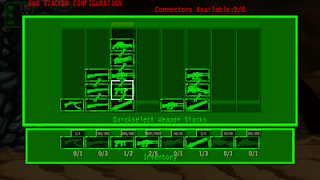 You'll collect not only the classic Shotgun, Tommy Gun, and Rocket Launcher from Serious Sam, you'll get to collect MULTIPLE OF EACH GUN. You know how it's fun to a hidden rocket launcher early in the game, but when you finally, "officially" are given the rocket launcher it's sort of a let down, because.. well.. you already have it! Say good by the to that sorry feeling! 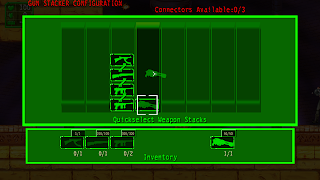 If you scour a level for secrets, find the Tommy Gun early, then you not only have the Tommy Gun, you'll have the chance to collect up to four Tommy Guns! 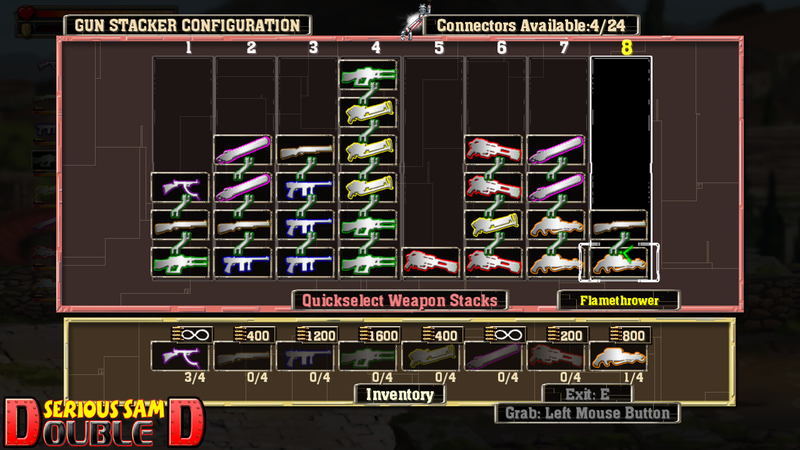 That goes for each weapon type--there are 4 of each hidden throughout Serious Sam Double D.
So now you've got tons of guns, and tons of connectors what do you do with them? Get all crafty and start sticking them together into various, explosive combinations! 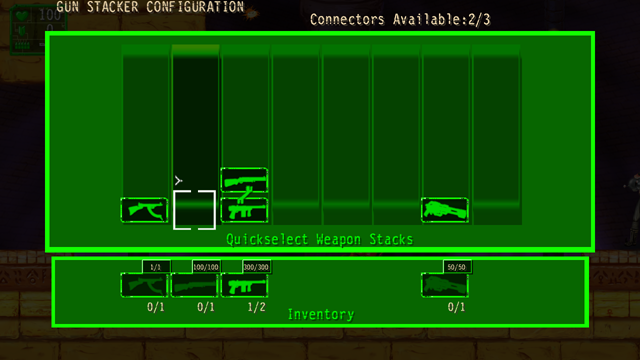 Here is an early peak at the Gun Stacker configuration menu (Bear with me, I'll try to make it sexier before the game's done). 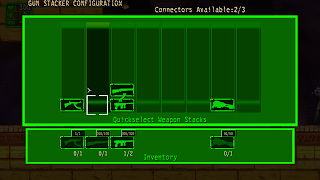 To stack your guns all you have to do is select a gun like the Shotgun here, move it over that stack and press the button again to confirm the Stack. Done! Super stack-a-ola, Shotgun-Tommy duo ready. But wait--we've got more connectors (upper right), looks like we have 2 of 3 still left! Can't let those got to waste. The Machine Pistol has infinite ammo, so whatever stack you put that it in, it sort of gets a 'free boost' in as much as that gun doesn't reload and can't run out of ammunition. 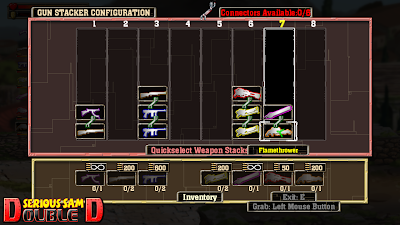 Type II Machine Pistol's hidden throughout the game are very special and very challenging to obtain! Let's just go full epicurean and stack 2 Tommys, a Shotgun and the Machine Pistol in one heap. We've exhausted our connectors, but it'll be pretty powerful. But our Grenade Launcher is looking lonely. If we select it and try to add it to the stack it won't work as we need an extra connector. 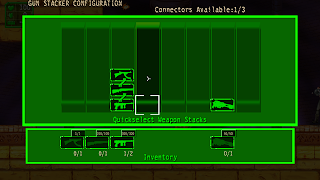 But we can remove a Tommy gun from the other stack and put it on the Grenade launcher. That's a nice combo as it covers you with fast, repeating fire from the Tommy, which fills in the gaps on the very powerful, but slow-to-reload Grenade Launcher. What's all this look like? Let's take a peak! Here Sam is blasting a Minor Biomechanoid in the face with the Shotgun/Tommy/Pistol stack, while a mass of seething Gnarr and Kleer claw at him from behind. So that's all fine and good--the sort of elementary Gun Stacking your little brother might do. But what kind of disgusting, orgiastic displays of male bravado are in store for those who able to survive later into the game? 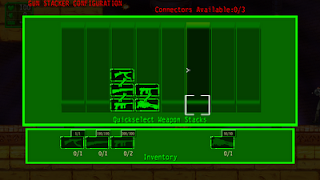 Here we have a gun collection as you'll see further into the game. 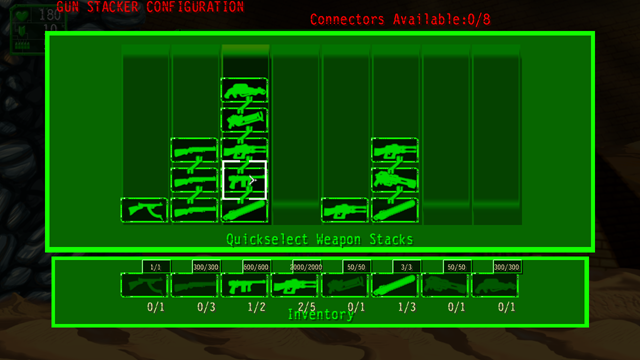 You've got 8 connectors to play around with and a silly amount of firepower. 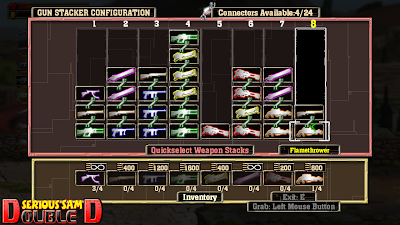 Now why would you need all these guns you might ask? First of all when dozens of slathering one-eyed Gnarr are climbing over their dead brethren trying to rip your face off, the more bullets you can shoot, the better. And secondly, you noticed the big blue alien about 5 times the size of Sam? 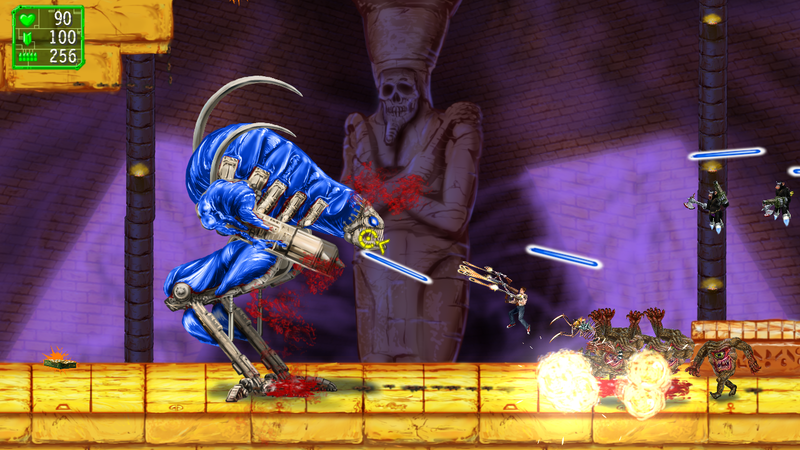 He's called a Minor Biomechanoid for a reason. 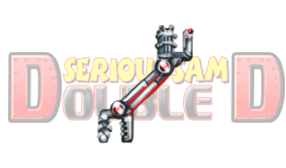 That's it for now, but be ready as we've got lots of fresh, new, gigantic enemies in Serious Sam Double D, that will require every bit of firepower you can Stack together. Now, back to the game-making! Here are some gun stacks, in the new menu. 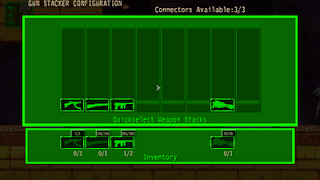 And here's a *lot* of guns in the new menu. Remember you can reconfigure your stacks any time! Just make sure you have found enough connectors.